With the Bible’s various prophecies of the downfall of Babylon, one would think Christian eschatologists would have a field day with the war in Iraq. But apart from a few perfunctory prophetic exegeses — Jeremiah’s “arrows of expert warriors” are laser-guided bombs, the “plunderers of the North” are looters at Iraq’s National Museum, Isaiah’s “chariot of men with horses” is an Abrams tank — this poorly organized, fundamentalist screed touts the Bible less as a crystal ball than as a rationale for a Wolfowitzian grand strategy against the Muslim world. On the temporal plane, Evans argues that the U. S. should use its control of Iraqi oil to break OPEC, and employ Iraq as a base (“only a short reach from the throat of Syria and Iran”) for the war on terrorism. On the spiritual plane, because Islam is “a religion conceived in the pit of hell” and terrorism is orchestrated by demons, he advocates the use of Christian prayers summoning angelic intervention to root out the evils of terror and Islamic fanaticism. Evans, founder of the Jerusalem Prayer Team ministry and author of Why Christians Should Support Israel, is especially concerned with the Palestinian-Israeli conflict. 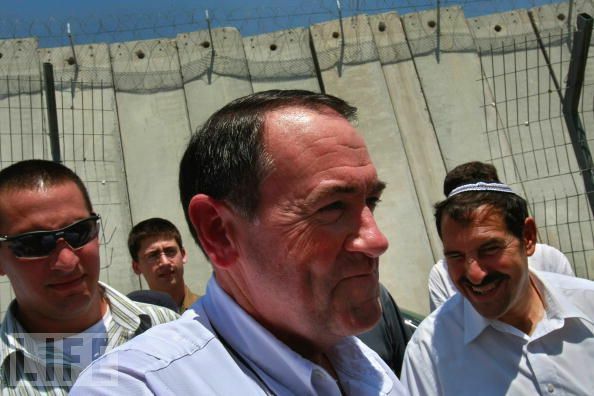 He opposes Bush’s “road map” initiative and insists that God apportioned the West Bank and Gaza to the Jews of the land of Israel, whose modern consolidation is a prerequisite for the Second Coming. Evans’s one-sided account of Middle East conflicts, based on fancifully symbolic readings of obscure Bible passages, concedes virtually no legitimate grievances or non-demonically inspired motivations to Muslims and Palestinians. His book is a disturbing addition to the debate on these critical areas of U. S. foreign policy. If you’re interested in a gentle primer on the realities of the Muslim world, I suggest you turn to our Canadian neighbors. Spend a little time on YouTube.com and watch reruns of last season’s “Little Mosque on the Prairie.” The Canadians get it. Instead of demonizing what they don’t understand (or because they know that greater understanding will conflict with another agenda), they laugh about it. And in the middle of the laughter, you’ll come away with a better understanding of the common humanity we all share. It’s an amazing little show, and you’ll be a better candidate for watching it. Thank you for taking the time to write to me and share your perspectives on the war and your concerns over how and why it has been waged. I agree with you wholeheartedly that this administration has made several mistakes in prosecuting this war, and I believe many of them are the result of not respecting the assessments of our intelligence agencies and not approaching the issue with a solid understanding of both the political and cultural dynamics of Iraqi society. This resulted in poor planning for the reconstruction and securing of a post-Sadam Iraq, and created the mess there which now threatens to create a regional war. As Commander and Chief, I will never wage war based on how I want it to be won, but the way my generals and the relevant intelligence experts tell me it can be won. I know there is a lot of controversy over the justifications for invading Iraq, but at this point the reasons our current president had for starting this war are not relevant to what has to be done by our next president to win it. The reality of the situation is that we have created for ourselves the responsibility of protecting Iraqis from terrorists, and destroying the “incubator of terrorism” that has developed since we took over. We simply cannot afford to leave the country in the condition it is in now, for that will only guarantee that our forces have to be redeployed there under even worse conditions. As president I will not shirk our responsibility to quell the violence in Iraq nor dishonor the sacrifice of our fallen soldiers by leaving the job unfinished. It is vital to our national security and that of our allies, as well as to the future stability of the Middle East. Thank you again for sharing your thoughts on the subject, and for your interest in my campaign. I hope you will visit my website to learn more about my positions on Iraq and the War on Terror, as well as other important issues facing our nation.